Each year we owe a tremendous amount of gratitude to our corporate sponsors. They help to contribute almost $3,000 to our efforts to support the JDRF. So first, our thanks to our tee-shirt sponsors. There generous contribution earns them a spot on our tee shirts. Additionally, our gratitude to the many businesses who donate amazing raffle tickets to our event each years. This was our inaugural event for Trey’s Avengers. It was a huge leap of faith and a huge success. Friends, family and beer drinking fans were invited out to Triple Crossing Brewing for live music, great raffles and a bit of Type 1 Awareness. A huge thanks to Triple Crossing for hosting us and for their generous donation. Thank you to everyone who came, gave a supportive word, bought raffle tickets and hing out with us. 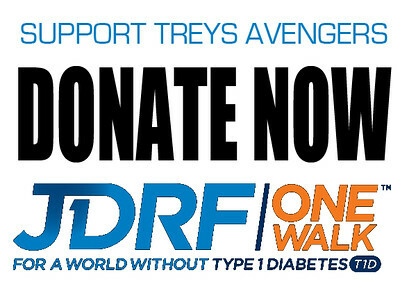 Trey’s Avengers is excited to have raised over $1,600 for JDRF today! What a crazy and unexpected year it’s been and what better way to end it than this Walk. Almost a year ago, Trey received his original diagnosis of Type 1 – it was a scary and emotional time as we started our journey into the world of Type 1. A world we will not leave until a cure is found. When our family decided to join the JDRF Walk for a Cure in July it was mostly a leap of faith. A “well…. why not” moment. We didn’t have big plans, we were just going to see what happened. And well, all of you, our amazing friends and family happened. We felt love and support from across the country as so many people send kind words and donations to JDRF and so many of our friends joined us on Walk Day. With your help, Treys Avenger’s raised over $7,200 in our first year! Thank you! And let’s just say that Walk day was perfect. Weather was perfect, walk was beautiful! And Trey’s Avengers won the tee shirt design contest! !